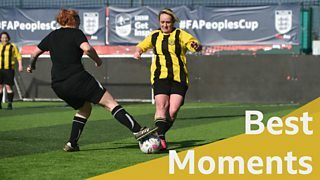 In the first round of the 2019 FA People's Cup over 4,000 teams played across 240 venues across the country. From original celebrations to cracking goals, watch some of the best moments from the nation's biggest five-a-side competition. Catch up with all of Saturday's & Sunday's first-round action - and watch highlights from the first round on the BBC iPlayer here.